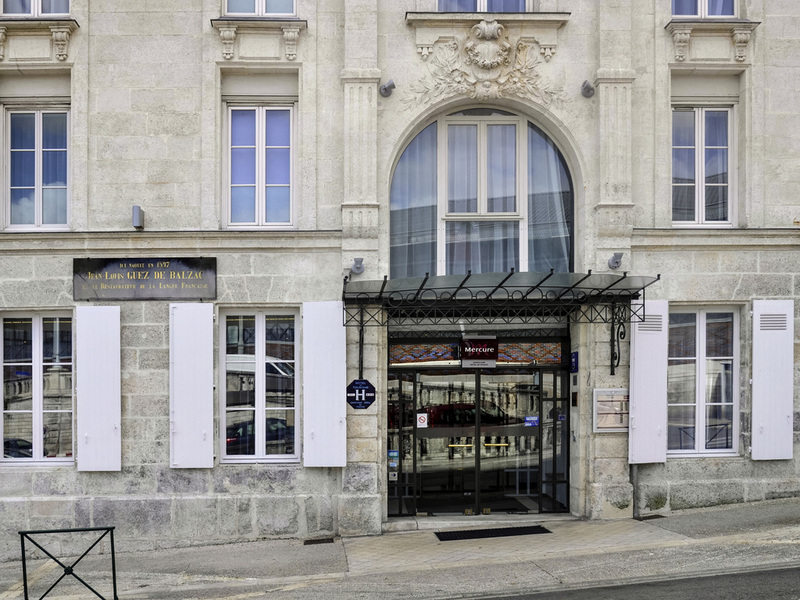 This city centre hotel is well placed at the heart of Angouleme, with great views across the city. Modern colourful interiors have been incorporated into this grand old hotel. Staff are friendly and helpful and bedrooms well appointed. We love this hotel. Always great. We stay here often and it is uniformly wonderful Comfortable , great staff, great position and thoroughly refreshing. We ate in the restaurant and it was really good. I recommend the fried Foie gras and French toast. fabulous.. We have always been totally happy here. We really love it.. Just perfect..... Can not wait to get back. Very pleasant, Staff well trained and welcoming, Thank you. I asked for and got a quiet room. Comfortable bed. Good shower. Very agreeable. Friendly and helpful staff. Excellent room. My room was aside of the welcome area, not possible to sleep, each concersvation from others clients were impacting negatively my sleep. I will not recommend this room. It is a pity to pay this amount for a such bad experience. Efficient check in. Great location. Very pleasant interior decor. Very good breakfast. Check in and out always efficient and the staff are always friendly and willing to help if needed. Organised a taxi for me with no issues and it turned up on time. The rooms are always spotlessly clean and the facilities excellent. My only issue is that breakfast is expensive for what it is. I stayed the following night at CDG airport for less which is unusual as the airport hotels are notoriously expensive but this doesn’t distract from how good your hotel and staff are. We stay often this hotel and are always completely comfortable and happy It is lovely and in a fabulous location with everything on the doorstep. The food is great , breakfast really nice and plentiful. I would like made coffee though and not machine.. The staff is the best and we will come back many times. Nothing nto to love..
Could not sleep in first night due to too much light in the room and curtains not stopping the light which should a standard in all rooms for such hotel. Check was effortless, parking was available and free. Room was very clean and well-appointed. Evening event well managed by hotel staff and breakfast was excellent. VoilÀ! Excellent accommodation, staff and facilities, but food very poor. The welcome, accommodation and service could not be faulted. We were attending our third Leggett Sales Conference & Dinner at your hotel, but the evening meal was very poor, both in the quality of cooking and temperature - both the starter and main courses were cold. OK but expensive for the lack of service, especially in the bar. Stay was OK, slow service in bar at peak time and no service at 2pm. I waited 10 mins for first drink, then the barman disappeared and I eventually went to reception to ask them to add the drink to my bill. No sign of a barman or I would have had another drink! Your loss! The arrangement of the room was also odd in that I could not open the wardrobe doors without dancing back and forth. The door only opens 90 degrees so if I am in the room, I have to walk past the door, then open it , take my clothes out, close it then walk back - just a lack of though in the design. If the door had a 180 degree hinge on it all would have been ok. It's an excellent location. Excellent for a road trip with parking. However the hotel needs modernisation. We were disappointed by the bar service, I had to ask several times to be attended. The choice of food in the restaurant was disappointing.